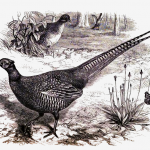 This group of bird images features drawings of pheasants. These fairly large ground birds are among my favorites. You can find a species of pheasant to represent virtually every color in the rainbow. We don’t see too many of them here in North Carolina, but I fondly remember spotting these birds in fields and along the tree lines when we lived in Pennsylvania. 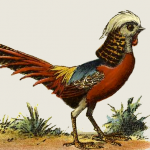 Our pheasant pictures, drawings and paintings represent several centuries of artistic styles and range from pen and ink prints to paintings reproduced in books. There’s bound to be something here to get your creative juices flowing. 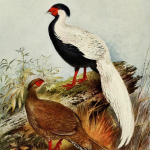 Vintage, full-color book plate of a pair of silver pheasants with crimson legs and facial markings. Males are black and white. Females are mostly brown. Argus pheasant drawing showing two males showing off their tail plumage much like the peacocks do. 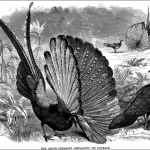 A bird drawing from 1881 by T.W. Wood of England. 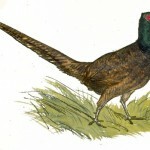 Vintage common pheasant drawing by the British zoological illustrator T.W. (Thomas) Wood. It shows a pair of these ground birds and a third one crowing. Fine example of vintage Asian art by the Japanese artist Tsunenobu Kanô (1636-1713). 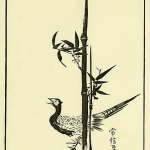 It includes a pheasant in bamboo done simply in pen and ink. Vintage Pine Mongolian Pheasant drawing from 1912 by Henrik Grönvold (1858-1940). This full-color bookplate is in the public domain and free to download. Vintage pheasant drawing from the L. Prang and Company. This full-color bird drawing is in the public domain and can be added to your own creative projects. 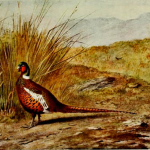 Vintage pheasant book illustration that dates all the way back to 1869. It does show its age a bit but it is full of vintage goodness.